Coal, which is one of the abundant fuel resources in the country, is a potential alternative to address energy crisis. As of 2006, Indonesia has about 4,968 millions tons of coal reserves. With the present market prices of coal at IDR 400 to IDR 1,500 per kg and with the application of the method of extracting heat energy from coal by gasification, a clean and convenient method of utilizing coal can be done as compared with the traditional burning devices where sulfur oxides and smoke emissions are common problems. In September 2008, the PT Minang Jordanindo Approtech designed and developed a coal gasifier to serve as alternative to conventional burners using LPG, kerosene, and diesel fuel burners. 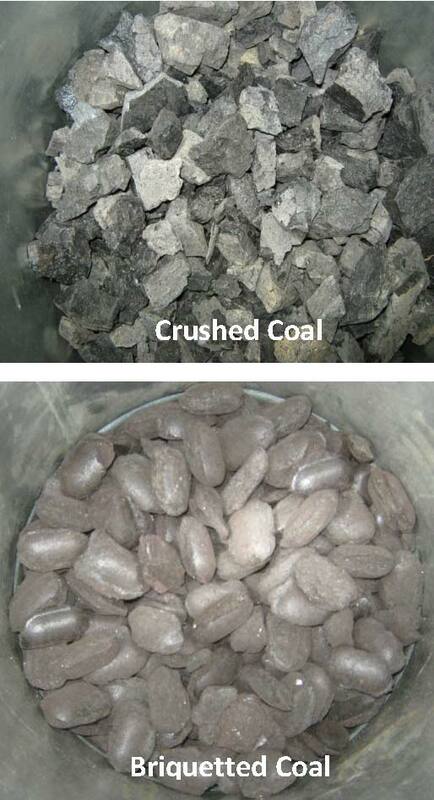 By gasification process, coal can be conveniently burned with almost no smoke and no sulfur odor at all. Combustible gases generated from the reactor can be piped-in to a burner for heating stoves, mechanical dryers, kilns, and even boilers. As shown in the first two photos above, the gasifier is a fixed-bed type operating in an inverted downdraft mode. It has a fuel feed tray for manual loading of coal into the reactor. The fuel reactor where the coal is gasified by burning it with limited amount of air, is made of 3-mm thick stainless steel plate having a diameter of 0.35 m. Burnt ash or slag obtained from the reactor is temporarily collected in the chamber before they are discharged through the ash outlet. The gas, before it is conveyed to the burner, passes through a 0.6-m diameter separator to remove fly ashes. 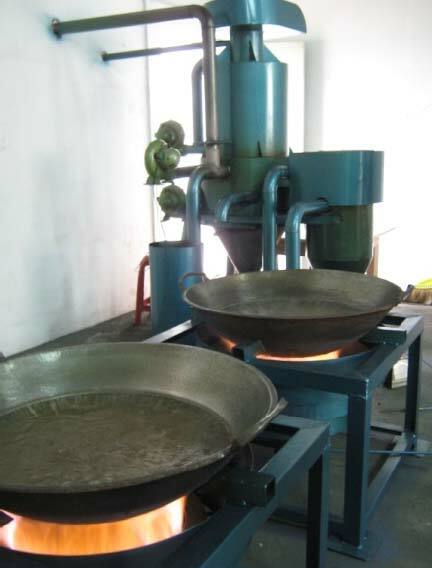 Two types of gas burners are used for the gasifier: One is a jet-type burner (0.15-m φ) for heating dryer or for firing kiln or other similar devices, and the other is a drum-type burner (0.40-m φ) for cooking, boiling, steaming, and/or frying. Pressure relief devices are coupled into the reactor and into the separator for safety purposes in discharging build-up pressure in case there is pre- ignition of gases. Three 2-1/2-in. electric blowers (1/4 hp, 220 V) provide the air needed for gasification and for cooling the reactor. The entire construction of the gasifier is made of mild steel as primary materials except for the reactor cylinders where stainless steel is used to minimize heat corrosion problem. The gasifier was tested using crushed and briquetted coals as fuel at 1 to 3-cm sizes. Charcoal fuel was used as igniter to conveniently set the fuel into firing with almost no smoke emission. At the start of ignition, valves are regulated to exhaust premature gases into the chimney and to divert quality gas into the burners when fully developed. The gasifier is operated by one person who needs to ensure of the proper operation and at the same time to load fuel and discharge ashes. Performance tests of the gasifier showed that it requires 22 to 35 minutes to generate combustible gases, from the start of ignition of fuel. After 10 to 25 minutes of operation, high quality gas is obtained from the gasifier. Coal consumption is minimum at 12 kg per hour and maximum at 20 kg per hour when the blower is fully opened. The computed specific gasification rate ranged from 125 to 208 kg/hr-m2. 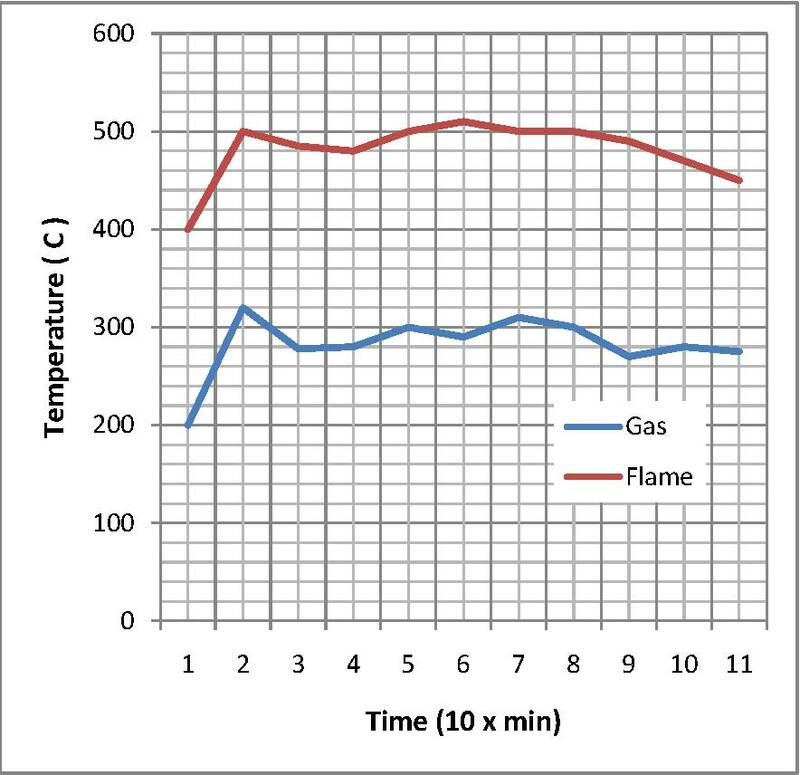 During the tests, the temperature of the gas leaving the reactor was measured at 200 to 320 C, while the temperature of the flame varied from 400 to 510 C. Based on the data gathered, the average computed gasifier efficiency is 68 percent while the overall thermal efficiency using the water boiling test is, 15%. Water boiling test indicated that 40 liters of water can be boiled within 30 to 42 minutes, depending on the degree of firing the fuel. The percentage amount of ash, including the slag obtained in each operation, varied from 6 to 10%. The computed heat output of the gasifer, based on combustible gases produced, ranged from 40,800 to 68,000 kcal per hr with an average power output of 65.3 kW. The gasifier total investment cost is IDR 15,000,000.00. 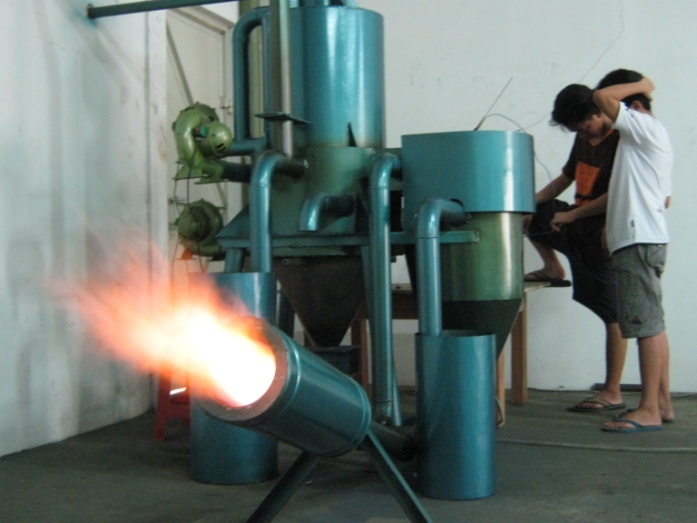 Using crushed coal as fuel, the gasifier requires an operating cost of IDR 4,288.71 per hour. Considering a 10-hour per day and 20 days per month operation, the investment cost for the gasifier can be recovered within 0.3, 0.9, and 1.4 years against kerosene, diesel, and LPG burners, respectively. For further information, contact: Djoewito Atmowidjojo, President Director, PT Minang Jordanindo Approtech, K2-7 Techno Park, BSD City, Serpong, Tangerang, Banten, Indonesia. Email: djoewito@yahoo.co.id. Website: www.minangjordanindo.com.